Facebook announced that it was no longer permitted to request users to become fans of a page to be able to participate in a campaign or contest. Therefore, at Cool Tabs we decided to say farewell to the fan gate too. At Cool Tabs we are happy to see that Facebook have decided to establish this rule, as we believe that fans shouldn’t be considered just a number. We think that all fan pages should try to attract and build up loyalty with users who are interested in the brand and have decided to ‘Like’ it in order to follow the page updates and be informed of any ongoing actions. Why is that? Because, at the end of the day, we want these fans to also become our clients. However, we shouldn’t stop facilitating and promoting the recruitment of new fans. But this is not a problem. Thanks to our applications, you will now be able to suggest campaign and competition participants and voters to become fans of your page or pages (and also follow you on Twitter, Instagram and / or Pinterest). How can you suggest a fan page with Cool Promo and Cool Promo White Label? Suggest your Facebook page/s to participants: You can recommend promo and contest participants to visit your Facebook page/s in the ‘Dates and contributions settings‘ section. You just need to include the Facebook page or pages (and/or Twitter, Instagram and Pinterest profiles) you want to suggest, together with a text for this action. We suggest you don’t go over 90 characters. Recommend your Facebook page/s to voters: You can recommend your Facebook page/s and / or your social profiles to voters in the same section. The page(s) or social profiles that you recommend in this section will be the same as those included in the previous section. However, a different text can be included here to encourage voters to become fans. We suggest the text you type here is 90 characters maximum. 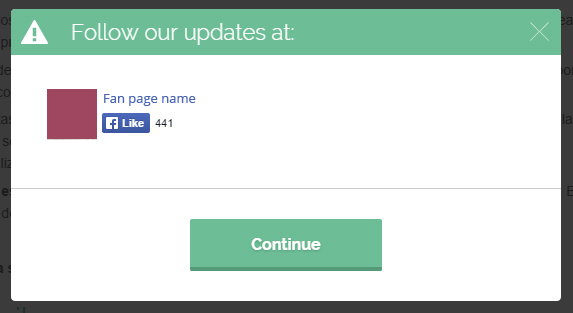 How can we recommend a fan page with Cool Promo Lite? We are sure that, with this new option that enables you to suggest your Facebook page to users through campaigns and contests, you will continue to attract lots of new fans to your fan page. However, your new leads will now be quality fans. Suggest your Twitter, Instagram and Pinterest Profiles to the Participants of Your Campaigns in Social Media. The alternative we have come up with for Facebook as a result of the end of the fan gate can also be used on Twitter, Instagram and Pinterest. When a user takes part in one of your campaigns, you can then ask him/her to follow you in Twitter, Instagram or Pinterest. 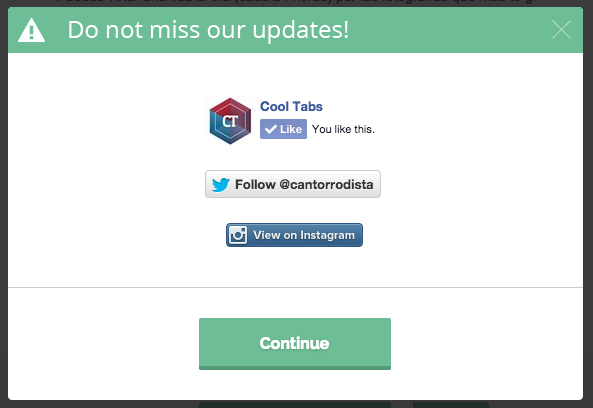 If you have any question regarding these changes or would like more information about the new alternative offered by Cool Tabs, please contact us.